A few years ago, a small corner in the back of the house was where the kitchen would be. A place to prepare meals and pile up dirty dishes. 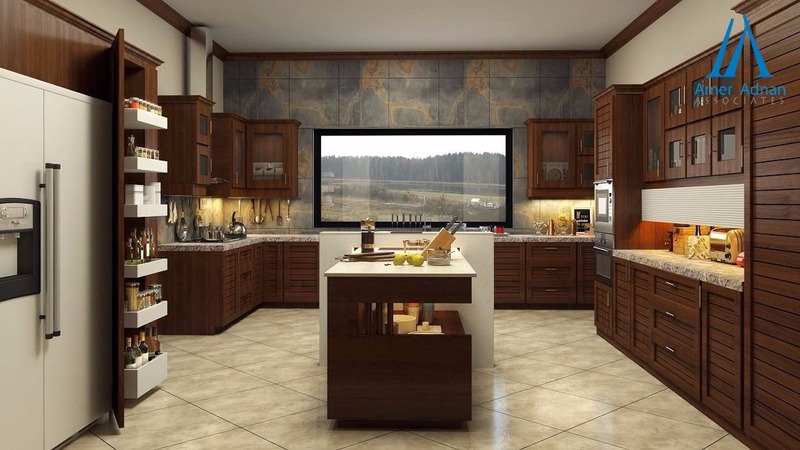 Fast forward to 2017 and the kitchen happens to be one of the most important rooms in the house layout plan for any interior designer or construction company in Lahore. Kitchen remodeling and design has evolved greatly over the years. In a study by a kitchen appliance manufacturer, 52% of respondents rated their kitchen as the room with the most financial value followed by the lounge and then the bedrooms and bathrooms. So with these refreshingly new stats, let’s take a look at some of the most trending kitchen layouts of 2017. Today, the first aim of architects and interior decorators when designing kitchen layouts is to have clutter-free worktops. This essentially means providing greater space to the cook in the kitchen with a clear surface to work on. Smart storage ideas are developing rapidly to enable such a layout. Multiple compartments and shelves for everything from seasoning and oils to paper towels and tea bags. Having clean and uncluttered counters in the kitchen also help in creating the illusion of a larger kitchen space. Particularly after its fame in Scandinavian countries, the industrial design for kitchens has become popular amongst interior decorators in Lahore. Heavily characterized by details such as exposed brick walls, exposed pipes and the use of rustic metals, the trend takes its inspiration from factory spaces. This look is a stylish combination of materials such as wood, stone and concrete creating innovative finishes using advanced engineering techniques. With every passing day, new technology is making its way into our lives and our homes. We can see examples of it being integrated into every operating function in the kitchen such as the faucets and the fridge. A lot of kitchens these days include smart gadgets and sensors. Sensor-equipped kitchen faucets are readily available now that can sense the presence of your hand underneath and allow water to flow. There are smart fridges that notify the owner when the grocery in the fridge is running low or for example a coffee maker which keeps your hot cup of coffee ready as soon as you wake up. Technology integrated kitchens are not only very interesting but are becoming rapidly popular as customers get to experiment with novel technologies. Quartz: Some Things Never Get Old! When customers want a touch of royalty in their kitchen, the number one item on an interior decorator’s mind is still to include quartz countertops. The extremely hard material that can virtually last for an eternity is a key factor for choosing quartz countertops. The biggest competitor to quartz is granite which lies on the high end bracket of the budget and demands greater maintenance. Unlike earlier times, quartz today comes in a wide range of colors to choose from as well as in more realistic stone patterns. However, it has been observed that there is more demand towards softer and neutral colors. The most popular colors would be grey, taupe, creamy or white finishes. There has also been an increasing demand for composite sinks – sinks that are made from the same material as the countertop. It helps create a cleaner, more uniform look.